How Is Steroid Addiction Treated? Anabolic steroids have many medical uses, but they are most commonly abused to enhance athletic performance. Heavy users may require recovery in an inpatient setting. Steroid addiction treatment options can range from counseling to an outpatient or inpatient/residential rehab. Medications that may be used in steroid treatment and withdrawal include antidepressants, analgesics or drugs to help restore normal functioning of the hormonal system. Things to consider in a steroid recovery center include whether the program focuses on steroids, its cost and what type of treatment you should pursue. Looking for Steroid Abuse Treatment? Who Answers? today. A treatment support specialist is standing by to help you find a recovery center for you or your loved one. Despite the efforts of anti-drug campaigns in schools and across the athletic industry, steroid abuse remains a rampant problem in high schools, colleges and among athletes and the professional level. Often thought of as a harmless way to boost athletic performance, steroid use can easily spiral out of control, leading to symptoms such as liver damage, joint pain, hallucinations and depression, among others. These symptoms often occur outside of athletics as well, with some individuals falling into addiction after taking prescribed steroids to treat asthma, arthritis, inflammatory bowel disease and a whole host of other conditions treated with corticosteroid drugs. These steroid users may find themselves victims of addictions that are physically, mentally and emotionally crippling. Sadly, few are willing to seek the treatment they so desperately need, as denial is a key trait of steroid addicts. Steroid addiction is a major problem that can lead to serious consequences down the road. Those struggling to kick the addiction often find themselves most successful when placed in the care and expertise of steroid rehabilitation facilities. By allowing the patient the necessary resources and privacy to work through his or her issues, steroid rehab and treatment programs offer a sense of hope that would otherwise not be available. It’s important to choose a steroid recovery program that meets your specific needs. Individuals addicted to steroids can obtain successful and lasting recovery. However, it is nearly impossible for someone in the midst of addiction to recover by himself or herself. Before addicts can even begin addressing the psychological issues that led to steroid dependency in the first place, they must be treated for the withdrawal symptoms that occur upon cessation of the substance. The easing of withdrawal symptoms is most successfully completed inside the supportive environment of a steroid recovery center. There, individuals have access to care from medical professionals. Not all steroid recovery facilities are identical, however, which is why it is important for those seeking help to choose steroid recovery programs that meet their specific needs. Steroids are unique among potentially abused substances in that they don’t cause a “high.” But their use can lead to a very real dependency—with heavy users sometimes requiring recovery in an inpatient rehab center. Detox to remove any remaining steroids from the body and to manage withdrawal symptoms. Therapy to address any depressive symptoms related to steroid withdrawal and work through what issues may have caused the person to begin abusing steroids. Medications to help ease withdrawal symptoms or address mental health issues. Aftercare to provide continued support after treatment and prevent relapse. The first phase of steroids addiction treatment is detoxification, which generally involves tapering off these drugs gradually. A physician should monitor the steroid withdrawal process. He or she can watch for any health problems that develop from too rapid of a withdrawal, which can result in endocrine collapse or crisis. The most common psychological side effect during the detox phase of treatment is depression. Users may also experience a number of other withdrawal symptoms as their dosage of anabolic steroids is reduced. Several different types of therapies may be used to treat steroid addiction. These help address issues steroid users experience when they withdraw from the drug and underlying conditions that may have led to steroid use in the first place. Body dysmorphia. Many steroid users suffer from “body dysmorphia” disorder and believe they are small and weak even though they may appear strong and muscular. Depression. Users may also experience depression and suicidal thoughts when they withdraw from the drug. 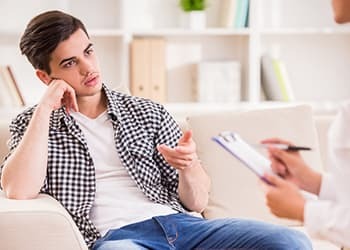 Cognitive behavioral therapy can be used to help challenge a user’s mistaken beliefs around their body image and low self-esteem, 2 as well as any depression stemming from hypogonadism, if present. Medication can be used to manage some of the withdrawal symptoms of steroids as well as some of the psychological symptoms from stopping steroid use. Aftercare is the next phase of treatment following completion of a steroid recovery program. Aftercare helps users continue to receive support after they leave treatment. Many aftercare programs are done on an outpatient basis and can prove crucial to relapse prevention. Individual therapy. This type of care includes meeting 1-on-1 with a therapist for support and to work on relapse prevention and coping skills. Group therapy. Group counseling includes many of the same goals as individual therapy. But participants meet with a group of people going through similar issues. Steroid support groups. Support groups allow people in recovery to interact with other people who have abused anabolic steroids. 12-step programs. These programs, which include Narcotics Anonymous, involve working through a series of steps toward recovery. Some steroid users may find the support and camaraderie of these groups helpful. Who Answers? if you need help deciding on the right type of steroid treatment. The severity of your steroid use. Whether you are abusing other substances. Whether you are experiencing other symptoms such as anxiety or depression. Talk to your doctor. Your physician may be able to address concerns you have about withdrawing from steroids and offer a referral for substance abuse treatment if necessary. Find an outpatient program. Outpatient recovery programs usually meet a few times a week for a couple of hours and include individual and group counseling as well as withdrawal symptom management. Seek treatment in an inpatient or residential rehabilitation program. These are live-in facilities where you receive individual and group counseling as well as continuous medical supervision. Inpatient programs also offer more intensive care for mental health or physical problems you may have in addition to steroid abuse. Does the program treat steroid addiction, and do the staff have experience treating it? Steroid abuse in not as common as other addictions such as alcohol or cocaine. But many programs still treat it and can give you information about their approach. How much does the program cost, and does your insurance cover it? Find out what kind of treatment your insurance will cover. If you don’t have insurance, look at whether the program offers payment plans, consider purchasing an insurance plan or look into financing options. Should you look for an inpatient or outpatient program? You may be able to get treatment in an outpatient center, which will allow you to live at home while getting treatment. However, if you are concerned about your abuse of other substances or any other mental health conditions, such as depression, you may want to consider more intensive care in an inpatient program. If steroids are causing problems in your life or the life of a loved one, get help today. Call 1-888-319-2606 Who Answers? to speak with a recovery support specialist about addiction treatment options for steroids.